The Ontario Superior Court recently ruled that the corporation responsible for the release of dry cleaning solvents from 1960 through to 1974 is li able for clean-up. In Huang v Fraser Hillary’s Limited, 2017 ONSC 1500 (CanLII), the Court ruled that Faser Hillary’s Limited liable for the release of the dry cleaning solvents that contaminated the neighbouring property. The Court awarded $1,632,500 for remediation costs and $201,700 for expert costs. Mr. Hung brought the legal action against Fraser Hillary’s Limited (“FHL” ) for remedial and related expert expenses for the tetrachloroethylene (“PCE” or “PERC”) and trichloroethylene (“TCE”) contamination of soils and groundwater at 1255 and 1263 Bank Street. The two properties owned my Mr. Hung were contaminated by the FHL, the owner of a dry cleaning business located at 1235 Bank Street since 1960. The dry cleaning facility was adjacent to Mr.Hung’s properties. The Court found that between the 1960s and 1970s, dry cleaning solvents used by FHL at 1235 Bank were allowed to enter the ground via dry cleaning filters and products stored at the dry cleaner and, as well, through the building’s sump in the basement. The Court also found that FHL, since knowing about the migration of contaminant to the adjacent properties owned by Mr. Hung, took no meaningful steps to address it. The Court found that from 1960 to 1974, the use of PCE/TCE at the dry cleaners owned and operated by FHL resulted in spills of these chemicals onto the ground. Used PCE would be stored by FHL in cardboard boxes in the parking lot at the rear of its property and left there until the weekly garbage collection. In addition to the storage practices in the rear laneway, there were also spills of PCE within the dry cleaners and that PCE contamination likely made its way into the sump. FHL’s handling practices of PCE/TCE changed in 1974 when FHL purchased new dry cleaning machines. The new machines and resulting new practices significantly reduced the amount of PCE/TCE used at 1235 Bank, and virtually eliminated the potential for spills. Mr. Hung discovered that his property was contaminated in 2002 when he retained an environmental consulting firm to conduct Phase I and II environmental site assessments (“ESAs”) of one of FHL’s properties he was considering buying. The Phase I ESA found moderate to high likelihood of contaminants on the FHL’s properties due to the drycleaner directly to the northwest. 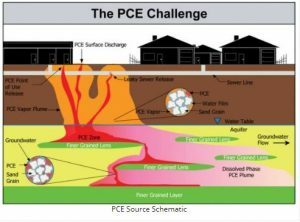 The Phase II ESA concluded that soil and groundwater had concentrations of TCE that exceed Ministry of Environment and Climate Change (“MOECC” or “MOE”) clean-up criteria. The Phase II ESA recommended that the soil be excavated and disposed of off-site, with remediation to be done with the FHL site or else that a barrier system be installed along the common property boundary. He recommended as well remediation of the groundwater. Mr. Huang testified that, as a result of the contamination, his bank would not advance any funds and would not renew his existing mortgage. He also testified that he is not able to develop his properties in their present condition and that, once environmental issues are addressed, he intends to proceed with his development plans. Experts called to testify in the court case explained that PCE is a chemical solvent used as a degreaser and predominantly used in the dry cleaning industry. TCE is another chemical compound that can exist independent of PCE or as a breakdown product of PCE. Dense Non-Aqueous Phase Liquid (“DNAPL” -pronounced “dean apple”) is the purest form of PCE. It is denser than water. When PCE impacts the ground, it does not migrate straight down. It chooses the path of least resistance and can spread out over a large area as it breaks down and falls apart during its descent through the ground. As a result, the final resting place of DNAPL may not be where it originally impacted the ground. Since it can spread out and migrate below the ground – both horizontally and vertically, there can be a large surface area that can have traces of DNAPL. This possible area of DNAPL is known as a “Source Zone”, which, again, is not necessarily where the actual PCE first impacted the ground. When clean groundwater passes through DNAPL it becomes contaminated and continues its migration. The experts agreed that the contaminants found in the groundwater and soils of the plaintiff’s lands are from the dry-cleaning solvents used by the dry-cleaning facility operated by FHL. On its decision to award costs, the Court heard eight different remedial scenarios from Mr. Hung’s experts. The costs associated with each of these scenarios varied considerably and some of these scenarios assumed conflicting hypotheses. For example, some scenarios proposed the clean-up of the source zone on all the contaminated properties, including, in addition to those of the Mr. Hung, FHL, and some unidentified non-parties (part of some of the residential properties to the east of the Mr. Hung). Some build a barrier to isolate the source zone and then treat the Mr. Hung’s properties through various methods including bioremediation. Other scenarios assume the excavation of all of the Mr. Hung’s properties, as contemplated by their development and cost for the incremental costs resulting from the contamination. To make it even more challenging, some assume that the applicable remedial standard is the residential and coarse soils standard for full depth, while other scenarios assume that the standard is the commercial and medium and fine textured soils for a stratified site condition. After having assessed the evidence and the various scenarios, the Court eliminated the scenarios requiring the remediation of the entire source zone with no barrier to isolate the source zone. 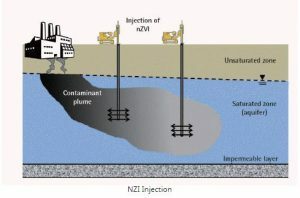 The Court decided on awarding costs to Mr. Hung at a budget of $1.2 million for a remediation that involved isolating the source zone of contamination with a permeable reactive barrier (“PRB”) and treating Mr. Hung’s properties with injections of zero-valent iron (ZVI) over a period of 8 to 10 years. It was the view of the Court that the options was, by far, the most carefully thought out, as well as the most technologically advanced and most efficacious, alternative. The court adjusted the cost upwards to $1.6 million to allow for the replacement of the PRB.